Launch eMail Bounce Handler. An untitled document is created. This document is made of 4 tab panels labeled Bounces, Settings, Rules and Log. Use the Dredge button or the 'File | Dredge' menu to process local files, local mailboxes or the clipboard. In order to process remote mailboxes go to the settings panel, enter you server settings and press the Start button. 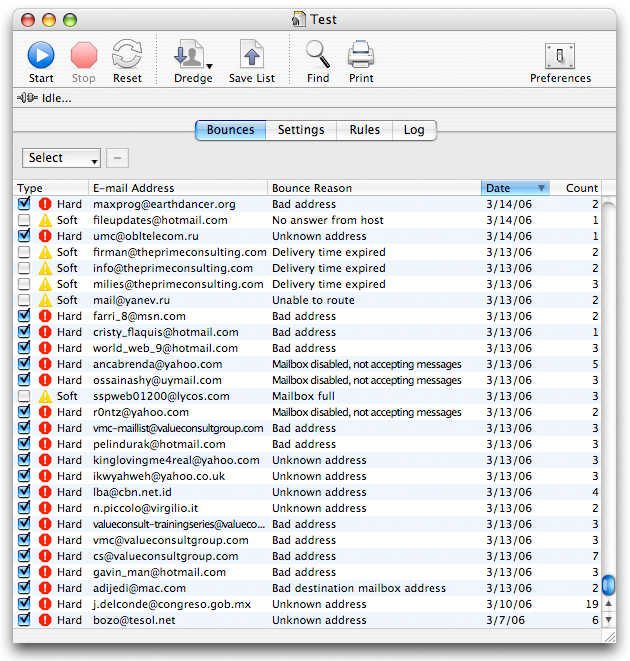 eMail Bounce Handler checks each available message from the given source using all active rules. If one or more rules are met, the message is processed, the email address is extracted and added to the bounce list. If the address is new, a new entry is created. If the address already exists, the count column (on the right) is incremented. If that count reaches a selected threshold the address is checked for exportation. That means the address will be exported when saving results. You can of course ignore that threshold and use the selector pull-down menu on the top left of the list. Type: Soft or Hard. A Soft bounce is caused by a temporary situation, address may be valid. A Hard bounce is an error, address is dead. E-mail Address: The email address in question. Bounce Reason: The reason why a bounce message was produced following RFC-3463 and RFC-3464. Date: Date of the very last bounce. Count: How many time messages sent to that address has bounced. In addition the Type column includes a check box. That check box marks an address for exportation. Only checked entries are exported. Usually you will let eMail Bounce Handler check entries automatically using the current threshold. Note that Hard bounces are fatal errors thus the check box is automatically checked. Soft bounces are generally produced by a temporary condition however if the messages sent to an address cause too many soft bounces we consider it as a fatal error so as soon the threshold is reached the entry is automatically checked. Start: Connect to remote server using current settings. Reset: Set internal pointer to 0 in order to process a mailbox ignoring any previously saved pointer. Dredge: Process messages from local sources, Text files, Clipboard or Mail, Entourage and PowerMail mailboxes. Save List: Export bounce list to a file. Find: Look for an email address in the list.